More than 200 people are now known to have died after a three-day siege at a Russian school came to a bloody end. 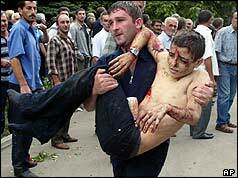 The hostage-takers deliberately fired at the backs of fleeing children as they ran from the building in Beslan, many of them naked and screaming. Others were killed inside when a woman suicide bomber blew herself up in the middle of the crowded gym where more than 1,000 people are believed to have been held. Most of the hostage-takers have either been killed or captured, Russian television reports say. Hundreds of people have been taken to hospital, most of them pupils at Beslan's School Number One, which is in the Russian republic of North Ossetia. It is still not clear who the hostage-takers were and what demands they made. Officials have linked the attack to Russia's bloody war with neighbouring Chechnya. The siege began early in the morning of 1 September (Wednesday) when a group of masked men and women, wearing bomb belts, stormed into the school, opening fire in the courtyard where pupils had gathered for a ceremony to mark the beginning of the school year. The attackers threatened to blow up the school if troops stormed the building and children were placed at the windows to act as human shields. According to a report from the Itar-Tass news agency, the attackers demanded the release of fighters seized in neighbouring Ingushetia in June during a raid on the region. Talks on Thursday between the rebels and the former Ingush President Ruslan Aushev led to the release of 26 women and children. Then early this morning agreement was reached with the rebels to send in vehicles to remove the bodies of those killed earlier. Soon after there were two loud explosions and then automatic gunfire could be heard. Heavily armed soldiers began running towards the building. A group of children, some covered in blood, escaped from the school in the confusion. Special forces were ordered into the school which, by now, was resounding to the sound of gunfire and explosions as the attackers detonated bombs and mines. The full horror of events was played out before a live television audience, which watched as a crowd of local people leaped onto a man they assumed to be one of the rebels and beat and kicked him until he was eventually rescued by police. The shooting went on for several hours. Reports said piles of dead bodies could be seen inside the school gym. By 1940 local time, the special forces said their operation to secure the school was complete. Those who survived the bloodshed told how they had been ordered to strip to their underwear and forced to drink their own urine because of the shortage of water. The attack followed the mid-air destruction of two Russian civilian airliners in August 2004, which was blamed on Chechen women suicide-bombers. Three months earlier, the rebels had assassinated the pro-Russian Chechen president, Akhmad Kadyrov. The number who died in the siege rose to 335, about half of them children. The final number of dead will probably never be known. Three days after the siege 180 people were still listed as missing. Many of the bodies were so badly burned as to be unrecognisable. President Putin admitted mistakes had been made and blamed foreign enemies for the attack, although he did not mention Chechnya by name. Reports said the hostage-takers got through a police road check. Security forces failed to secure the perimeter to the school which meant many locals got into the area while the standoff continued. The only hostage-taker to be captured alive, Nur-Pashi Kulayev, a Chechen carpenter, was sentenced to life imprisonment in May 2006. But many relatives of the dead believe the Russian government should take some of the blame for the bungled rescue attempt.